The Fruit bat depends on sight rather than echo-location. Additional information about the Fruit Bat Graphic: Native to the tropical and subtropical regions of Africa, Asia, and Australia, the fruit bat, or Flying Fox is a quite large bat, as their facial appearance is similar to a fox they have acquired the nickname "Flying Fox". Siteseen Ltd. are the sole copyright holders of this Fruit Bat picture, unless otherwise stated. We only authorise non-commercial picture use and particularly encourage their use for educational purposes. 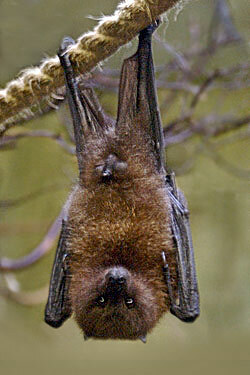 This Fruit Bat picture is not in the Public Domain. 3) Use of this Fruit Bat picture, or any of our pictures on websites re-distributing copyright free material is strictly prohibited.